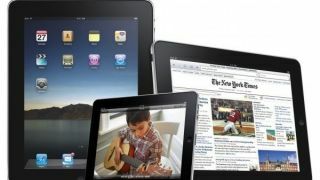 Apple may be about to drop support for the first generation iPad when, as is expected, it announces iOS 6 at WWDC on Monday. Chinese website WellPhone.com claims to have obtained a list of links to the iOS 6 Beta version that Apple may make available to developers following the keynote address from San Francisco. While those links include the new iPad, iPad 2, iPhone 4S, iPhone 4, iPhone 3GS, the fourth and fifth generation iPod touch and Apple TV, there's no link for the original tablet. As well as the original iPad, if the list proves correct, the third generation iPod touch will also miss out. Currently the links direct users to inactive pages. MacRumours points out that a similar list emerged shortly before last year's WWDC keynote from the Moscone Center. It is almost guaranteed that Apple will announce the next generation of its mobile operating system on Monday, as the company has taken the somewhat unorthodox move of hanging "iOS 6 banners" throughout the conference hall. Apple is also expected to show off the full version of Mac OS X Mountain Lion, with rumours also suggesting we may see an Apple TV SDK.